Calendar cartoon illustrations are a great form of promoting your company and business. I’ve illustrated cartoon calendars before and they are always a lot of fun and interesting to work on. I’ve created custom cartoons for corporate business calendars and have done cartoon illustrations for consultants calendars to use as hand-outs at their seminars and gatherings. This may be something for you to consider if you’re thinking of another unique way to generate attention for your business, company or service! 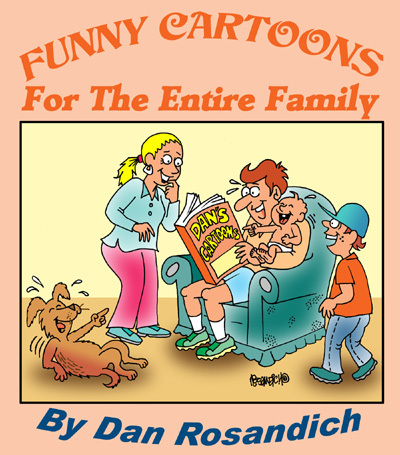 Cartoons for calendars and diaries available! A custom cartoon calendar with a different cartoon for each month of the year will impress your clients and vendors when they see it. It will make a mental impact on them and in fact, they may want extras to give to their friends and family . . . more advertising for you! 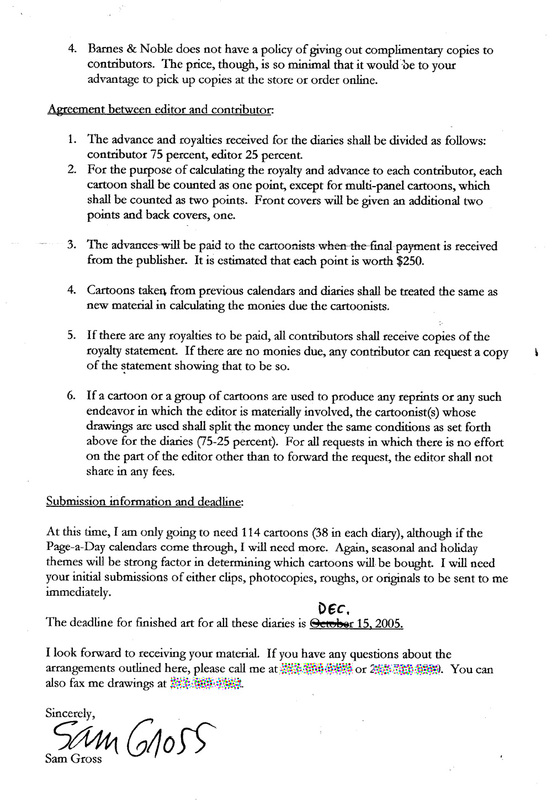 I was on a call out list where New Yorker cartoonist Sam Gross would send a letter to various cartoonists to submit their single panel cartoons to consider for various calendar publishing projects that Sam was contracted to handle. As you will see by the standard cover letter, it was a very copyright friendly proposition and all we had to do was submit gag panels accordingly. Similar to the way we would show our work to magazine editors on a freelance basis. As you can see, some of these projects go way back, over a decade. 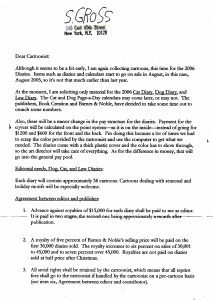 There were other similar projects we were asked to submit to, and now for the life of me, I’m not certain of all that I had cartoons published in. 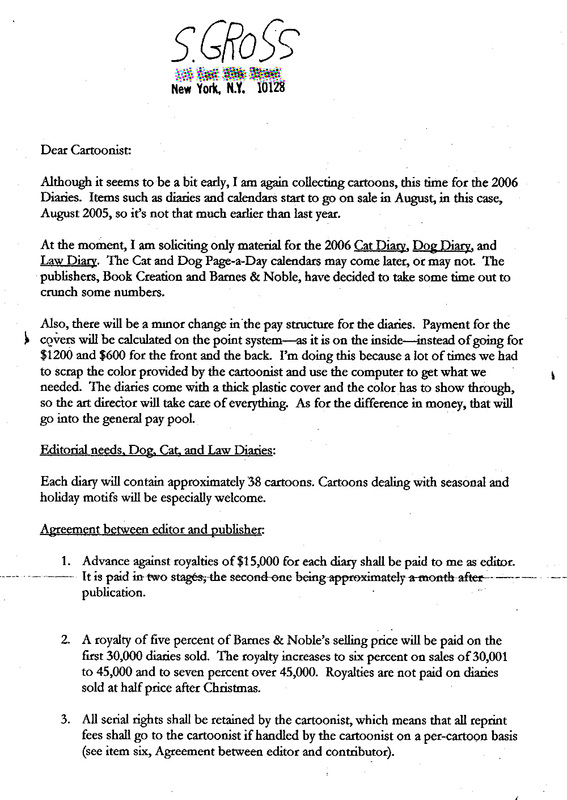 There were even royalties offered on a sliding scale, based on how many copies of each diary that were sold. 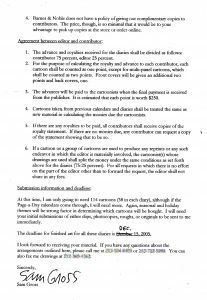 Overall, the point of this posting is to let any professional organization or association and business know, that cartoon humor makes an ideal artwork for using in calendars. Contact me anytime using the form on this page or the email address located on my contact form’s page and I can answer any questions.